From modern flags and medieval banners to family house symbols and heraldic crests....symbols and regalia have meaning here Bohemia. 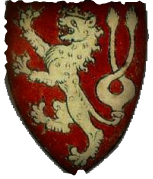 Discover the true meaning of why the Czech Lion has a split tail and what secrets that the House of the Two Golden Bears in Prague holds to this very day. This is the national anthem of the Czech Republic and I believe it to be an appropriate question. The question is answered as the song progresses, yet the enigma that is "Czech" still lingers even today. The Czech people continue to find their collective footing on the world stage and with representative democracy. For hundreds of years this Central European region as been the focal point of power struggles between Kings, Popes, "Absentee Landlords", Emperors, Fascist & Socialist Ideologues, etc. 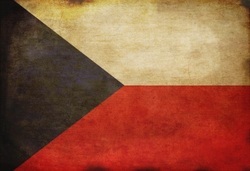 Many banners have waved over the Czech lands in her long history. The fact that the Czech people were able to retain their identity by holding onto their unique language, culture and history is nothing short of amazing and a testament to their will and character. I believe the Czechs of the 21st Century have a better idea of who they are today than ever before. Their sacrifices, perseverance and resilience have more than answered the question, "Where is My Home". (similar to the neighboring state of Poland). The blue triangle was added at the hoist to represent the joining of the Slovak nation with the Czechs when Czechoslovakia was created. Among Czechs is my home.